Having a toddler in our home is special these days. We absolutely loved it when our kids were that age. We had the privilege of watching our youngsters learn new things that we took for granted. Observing their little discoveries brought us great joy. The cheerful greetings our toddlers gave us in those days are gone now, but grandchildren have taken up the delightful habit. They look forward to coming to the farm to see Grandma and Grandpa. We enjoy sharing our lives with them. Grandpa works out of doors. He comes indoors for breakfast, lunch and supper. Our grandson waits expectantly when the basement door slams shut. That is Grandpa’s door. Now, Grandpa is a fun person. He plays ball with this toddler. He can take him for tractor rides. He plays, “Hide and Seek” with his grandchildren, too. Waiting for Grandpa to come indoors comes with anticipation. 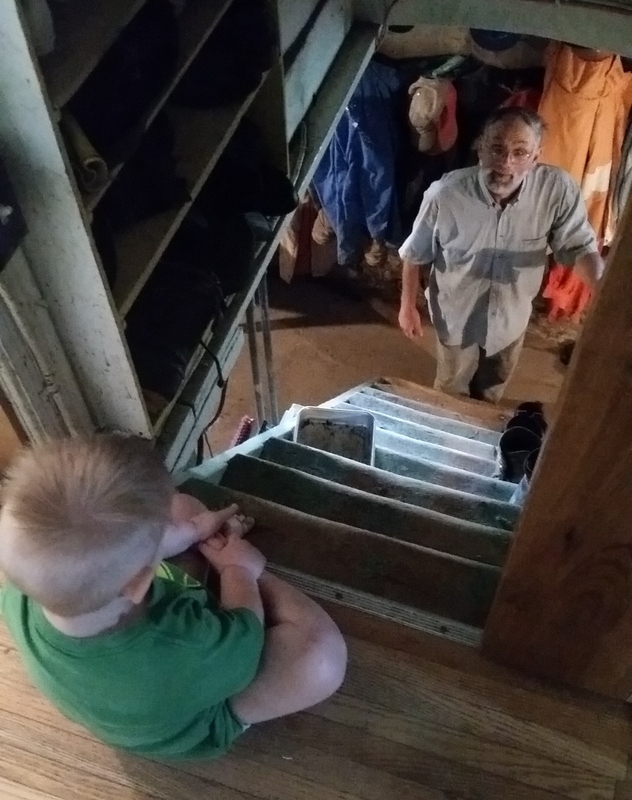 When our little guy hears the telltale “thump” of the basement door announcing that someone has come in the basement, he expectantly waits for the one he loves…Grandpa. He does not always get a glimpse of Papa, but each sign raises his hopes that pretty soon he will see his grandpa. The signs include: the light goes on in the basement; the weather radio blares the forecast and weather conditions; the water faucet gushes its chilling streams as somebody washes his or her hands; occasionally a familiar shadow slips across the wall. 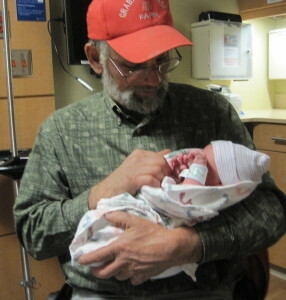 Patiently, with excitement building, our grandson broadens his grin and eagerly waits for his great friend, Grandpa. Every second our the little fellow listens and waits. All at once, Grandpa comes into view. He greets the little soul who watches intently, puts one foot up on a step and unlaces his work shoes, one at a time. Finally, he comes up the stairs. The wait is worth it! Grandpa scoops the little child up in his arms and they go to play with toys together. Can you feel the excitement this little boy must feel? Can you imagine the joy that is welling up in his heart? Can you appreciate his focus on the one he awaits? And how about the anticipation and the hope fulfilled he experiences? Pondering this little child’s waiting, you may agree with this thought. How nice it would be if we all looked forward to our dear Lord’s coming like a little child waits eagerly for Grandpa. How are you waiting? There are times when Grandmas can be busy on the farm. When the grandchildren come, while they are still very young, even Grandma’s work can seem interesting to them. I had such a day. Several of our grandchildren came to visit along with their Dad. The men and boy went to the pasture to cut firewood. The girls stayed closer to the farmhouse. The farm cats attract their attention. The youngest , however, was told to stay with Grandma in the house. Grandma had a lot of work to do. Much of it included cooking or baking to feed the hungry crew. I set about to get the jobs done. What a sweet sentiment. But there are times when watching Grandma work is of more help than doing it with Grandma. Yet today, I did have some tasks where she could help me. I had to bake a cake. All three girls helped with that. Licking the spoons was the best part. Then we worked together on the frosting. With that finished the older girls tired of the kitchen and trekked out of doors to pet the kitties. With my pot of chili con carne steaming on the stove, one more job rested on my shoulders. I had to clean raspberries. Now, raspberries are yummy. I think so, the kids think so…and so do the raspberry bugs! There was plenty of work ahead. Many may think that this was not a big deal. But someday I hope our little helper can look back and remember the time she helped Grandma clean berries. She may recall the value of observation and perseverance. I hope, too, that she will feel the sense of satisfaction in doing a job thoroughly and well done. 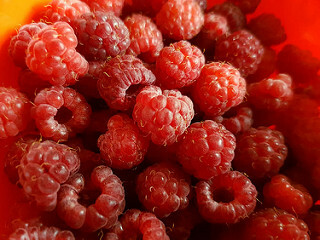 To me, it was delightful to hear the clear child’s voice declare, “There’s no bug.” And I will be glad that when we eat the red raspberries we can be reasonably confident that there are no bugs. Even berry-cleaning turned out to be quality time with my granddaughter. Looking ahead we see December waiting in the wings. A family favorite day is celebrating our Lord’s birth, Christmas! 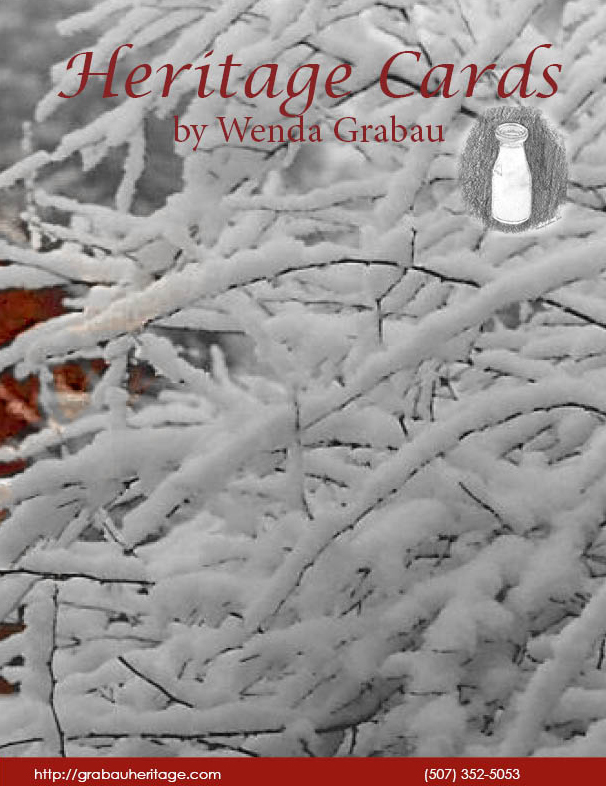 For sending your fondest holiday greetings, we have a selection of cards that focus on Christmas and winter. Enjoy our best Christmas prices ever! 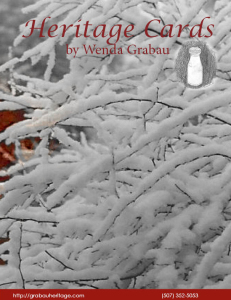 Treat yourself and have a look-see at our 2016 Christmas Catalog. 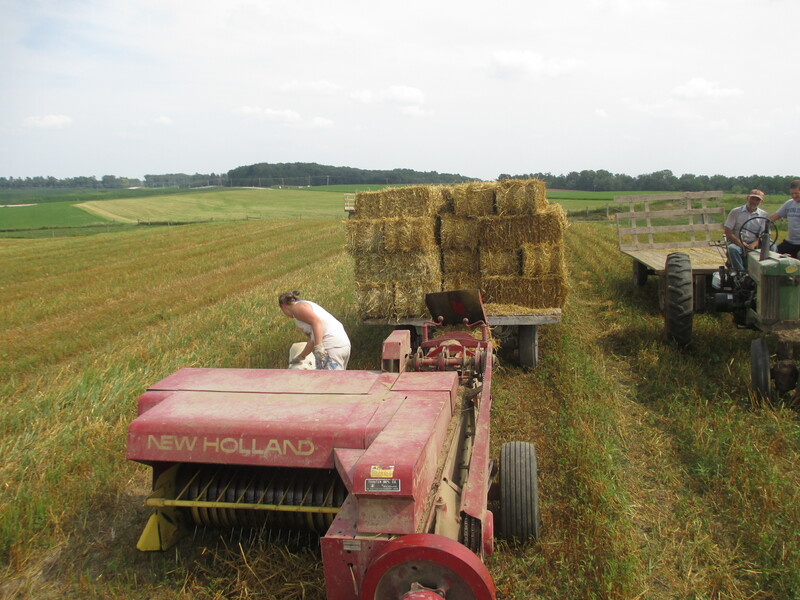 If you have never had the job or pleasure to load a hay wagon, you may have questions. You see, riding a wagon is not easy. The wagon does not have springs on it to make your ride a soft one. One tip is that while you ride afoot on the wagon, do not lock your knees. It will take time to develop the skill to ride with confidence. So be patient, your skill will develop and become much more comfortable with time and experience. You may have heard about how sailors have to develop their “sea legs”. Well, it is the same here. You will have to get “wagon legs”. 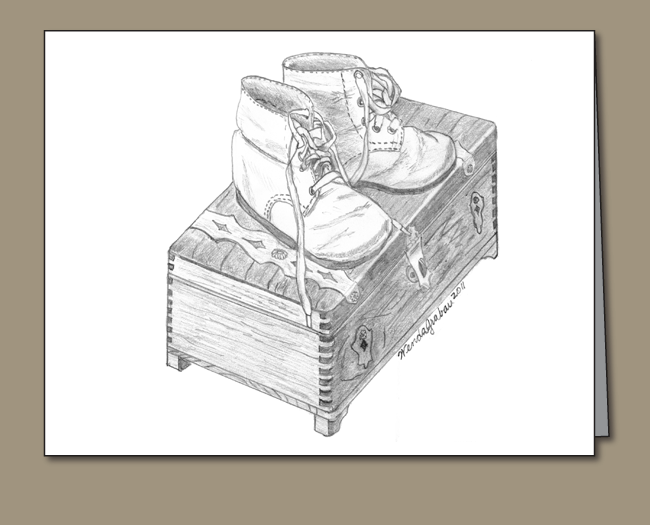 To get your “wagon legs”, the key is proper placement of your feet and how you stand on them. Stand with your feet at least shoulder-width apart with one foot in front of the other. How far in front will vary with the terrain and the likelihood of braking. Also stand with your weight forward on the the balls of your feet. Be prepared to adjust your stance as needed during turning and going up or down hills. Keep alert to avoid accidents. Between loads get a drink of water to keep yourself hydrated. Be sure to use shoes that will not slip on the stray pieces of hay which will break off from the bales. My daughter uses old tennis shoes. They work for her. My husband uses chore boots. Both styles get the job done. You may prefer to wear loose clothing that you are willing to get dirty. Consider whether or not you want to wear long-sleeve shirts or short-sleeve shirts. Long-sleeves prevent scratching on your arms, but short-sleeves are cooler. You will probably want to use work gloves for protecting your hands while grabbing the twine. When you pile the bales, be sure to pack them tightly. If a load is not stable, the greater the chance for the bales to fall off in transit and force you to put them back on and stack them when the wagon is no longer in motion. Being in motion provides good momentum for stacking well. An essential part of the work day and ensuring it goes smoothly is listening to the baler. 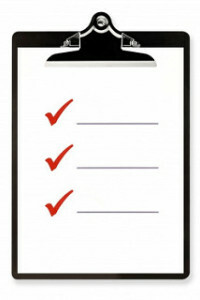 Both the driver and the stacker must be alert to any abnormal noises that could delay the work. In addition, is the need to watch what is going on at both ends. The two working the rig are seeing things from different perspectives. The driver can see if the hay is getting picked up or stuck in the baler. The stacker can see if the knotter is slipping knots or losing the twine. This is definitely a team-effort. I hope these observations for successful loading bales on your wagon are helpful to you. Always use caution as you work. Nineteen pregnant cows were sold that day. They were taken to another small dairy about a half-hour’s drive from Heritage Farm. Hopefully, they will be well-cared for and produce a lot of milk and offspring for many years to come. 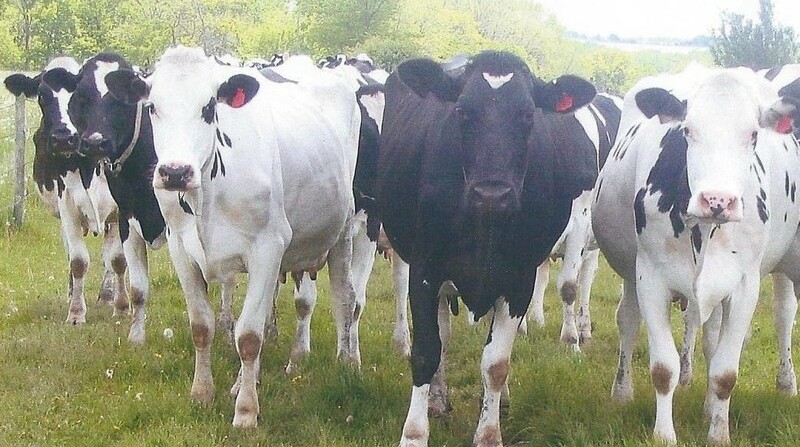 Five more non-pregnant cows will be sold on August 26. We will be keeping one of my favorites to provide “house milk” for the winter. It was cows that kept me disciplined and motivated. It was the cows’ offspring that taught our children responsibility in caring for animals. Cows taught us many lessons about life and death. Wendy knew how hard it would be for me to sell our cows. She had contacted many of our relatives and friends to inform them of the event. On the morning of the sale, she followed me around recording what had been my normal routine for so many years. Our daughter stayed home from work as the cows were being loaded to support me during that time. An elder daughter and her family arrived (after driving 3 ½ hours) just as the last cow was being loaded. They provided a very helpful distraction for that afternoon and the next day. Over the past week many relatives and friends have stopped by, called or sent a note to helped me get through this tough time. We are blessed to have so many special people in our lives. 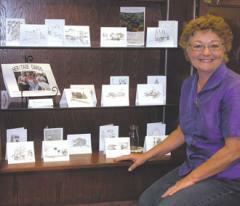 Visit our store and the catalog for card designs from Grabau Heritage Farm. Most of Heritage Farm’s dairy cows were sold on August 9, 2016. It was an emotional day for me. I had milked those cows or their ancestors for more than 38 years. It was the production from those cows that had made it possible for Wendy and me to raise our children on this farm. The ancestors of those cow, milked by Norman and Judy Grabau had provided income for the family I grew up in and even my grandparents, Ernest and Selma Grabau, had raised their family with ancestors of the cows we recently sold. For me, it was like selling part of my family. 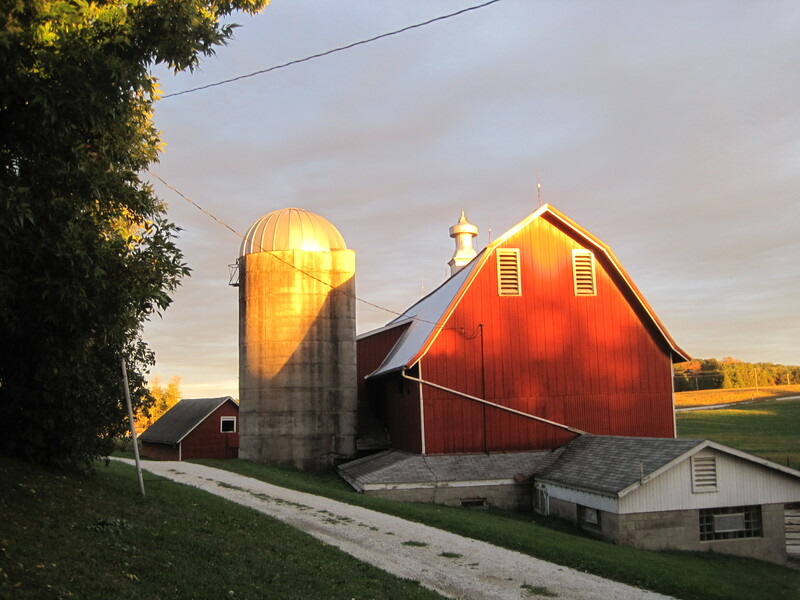 As a young couple, we arrived back at Heritage Farm in 1978 to begin the process of taking over the farm from my parents. 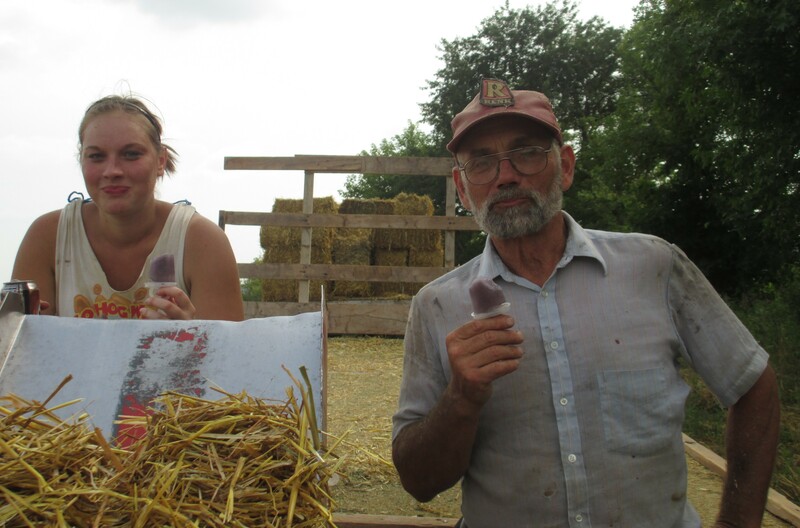 People told Dad and me that a thirty-cow herd would never produce enough milk to support all of us. We were told we either we had to get bigger or get out of business. They were wrong. For the last 38 years our small herd provided almost our entire income. Neither my wife nor I ever held an off-the-farm responsibility that gave us a significant income. The income our cows produced allowed us to work together on our farm and raise our four children. It was the milk our cows produced that made it possible for our children to attend Christian schools (elementary, high school and college.) Our cows and the blessing of the Lord keep us from being obligated to a financial institution for most of those 38 years. In the farm field driving tractor, I have the chance to notice what God has done out in the small piece of earth that He has entrusted to us. The past few weeks have been highly devoted to baling hay. Sometimes I crimp hay, other times I rake hay. Still other times I drive tractor for the baler. Our fields vary in their sizes and shapes. One such field we have a trapezium in shape. A trapezium is a four-sided shape where none of the sides are parallel. Hence, one side of the field has a very long row. The other side has a short row. The row lengths vary gradually as we process the hay. As I drove round and round on that field, I pondered the center rows. They tended to be average in length. Average is a term that I heard as a youngster. As a student I learned that average was nice. If I was average I was similar to others. If I had average grades, I was just as smart as most other individuals in my class. Average was a “safe” place to be. 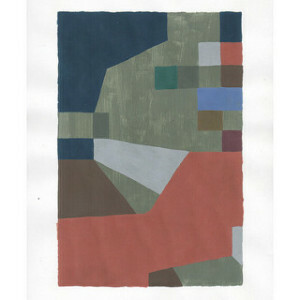 Yet as I pondered the term in the field, I noticed that the long row was noticeable. The short row, also was notable. The average rows were rather hard to distinguish from the other rows since their lengths were so close in appearance. One tendency for us as individuals is to want to be like the rest of the world or to fit into a crowd, to be like them. Yet if we do, we cannot be noticed very well, just as the average rows in my field. As a kid, I stood out. My freckled face made people notice and call me, “Freckle-face.” It was not something that endeared me to them, it separated us. I longed to be like them. But the difference was noticeable, and I stood out in a group. For a child this was difficult, but I got over it. I like my freckles now. Some might even admire them these days. The lesson I learned from the field was that the things that make us not-average display God’s creativity. He makes each of us different. We don’t have to be like everyone else. We wear the badge of “Unique” and “Specially-Made”. Which perspective are you living in . . . God’s or the world’s? 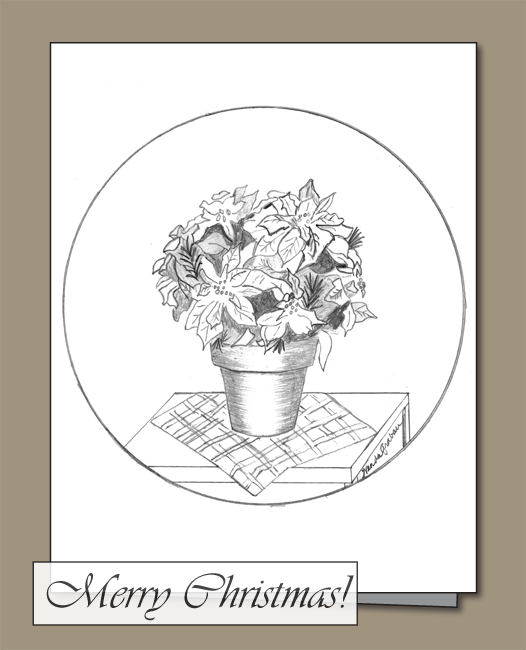 SaveSee our store for some “Specially-made” designed cards that may suit you. Ivy, our adopted kitten, has been growing up to become a driven kitten. She likes to eat. Food is motivating for her. This could be quite an asset on the farm. Food is a fine reason for Ivy to pursue her next meal. Unfortunately, she has not been trained to hunt. Even though she has instincts as a cat, her adoptive mother, Baby, is not a hunter. So Ivy does not have a seasoned hunter as an example to follow after. But food still draws her. 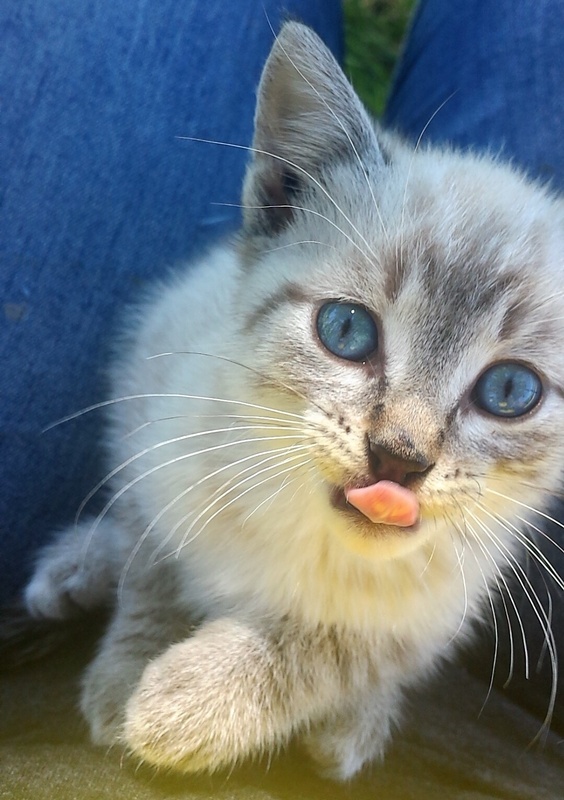 Though her cuteness endears her to most of us on the farm, she would be much cuter if she would become a mouser…a cat who keeps the rodent population in check. Several cats who call the farm, home, congregate and tend to wait for a handout. How much nicer it would be to have Mousers to earn their keep. If the cats don’t do the work, we have to take measures into our own hands. 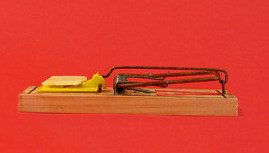 We trap them, the mice, that is. 🙂 We set up a trap for unwanted mice several days ago. 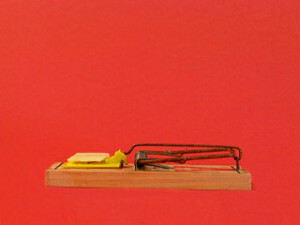 And, sure enough an unlucky mouse SNAPPED the trap! On the farm we find uses for things that others might discard. In this instance, we recycled the dead mouse. We offered it to a “herd of cats” just outside the farmhouse. The fastest cat, the one most interested in a mouse for breakfast was Ivy. Ivy’s appetite shows her grit. 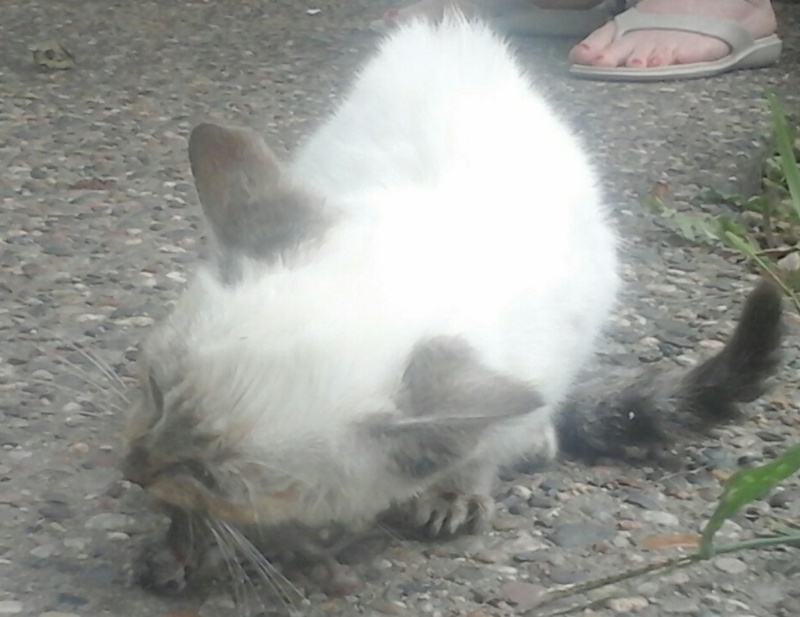 She growls when patted while she has a newly found mouse in her grip. She rejects the advances of curious cats in the “herd”. She is single-mindedly busy. This could be the discovery of a real hunter on the farm. We here at Heritage Farm certainly hope so. Hurray for IVY! And way to go, Mouse! How does a Grandfather win the hearts of his children’s children? I suppose there are many ways. But I will share with you a few that seem to work at the farm. 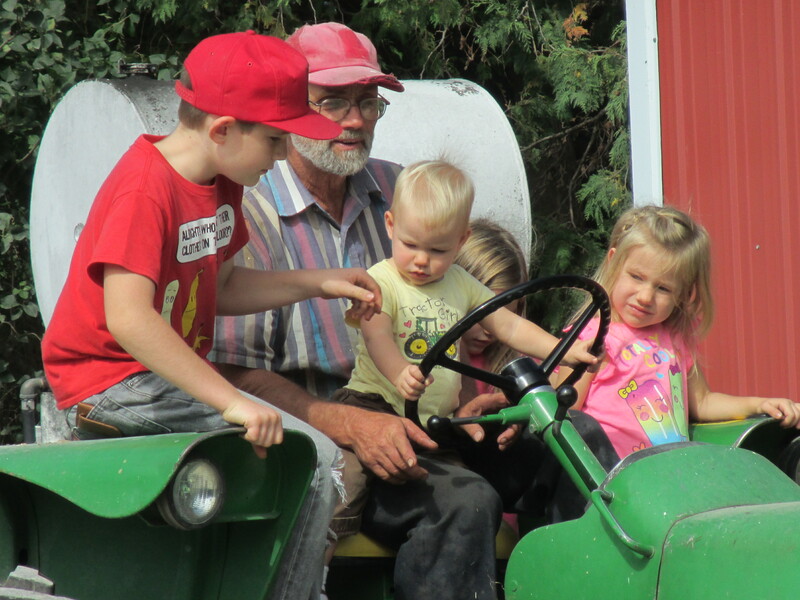 The Grandpa on this farm works hard and diligently to provide for his family. He milks cows and raises chickens and a few Holstein steers. There is much field work to do to maintain the livestock. Time for playing with the grandchildren is limited. However, this Grandpa makes it his aim to do things with his grandchildren when he can. For the youngest ones, he will hold the babies after his meals. Grandpa and baby seem to fall asleep together. It may only be a few minutes, but that is quality time for them. As the children grow to toddling, Grandpa gets more active with them. He resorts to playing ball with them in the living room. The child can hear Grandpa’s enthusiasm as he blurts out, “Let’s play ball!” Grandpa sits on the floor and rolls or bounces the ball to his little partner. Sometimes Grandpa can’t find the ball. 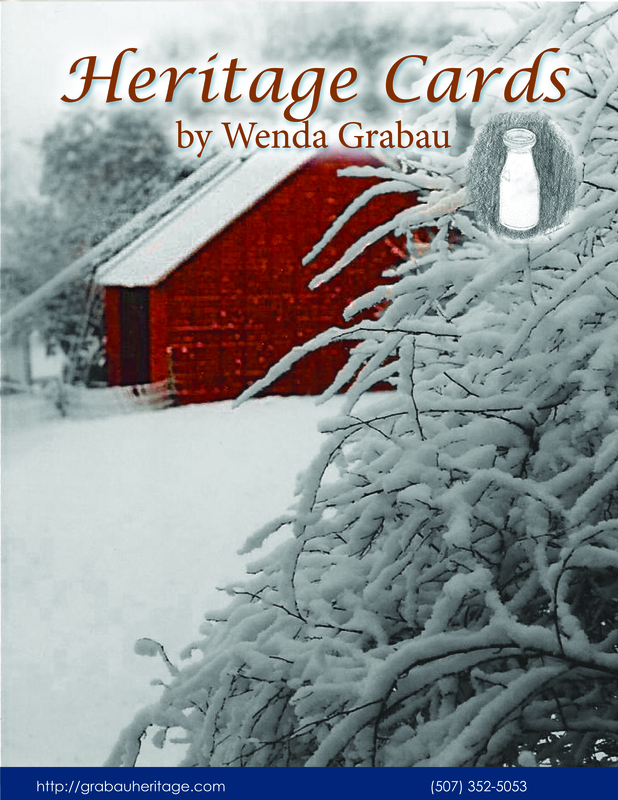 Our farm is named, Grabau Heritage Farm. We acquired it through our ancestor’s faith and labor. We have labored here ourselves. Although land is valuable, our greatest heritage is from the Lord, our children. Children are our reward. What better hearts are there to win than theirs? 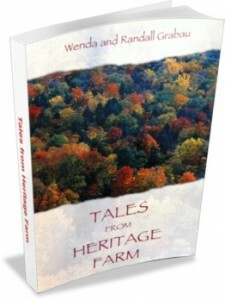 The book, Tales from Heritage Farm is available for sale from this website. If you have questions about how to load a hay wagon, here are insights into our operation. I hope it might be helpful for you in yours. 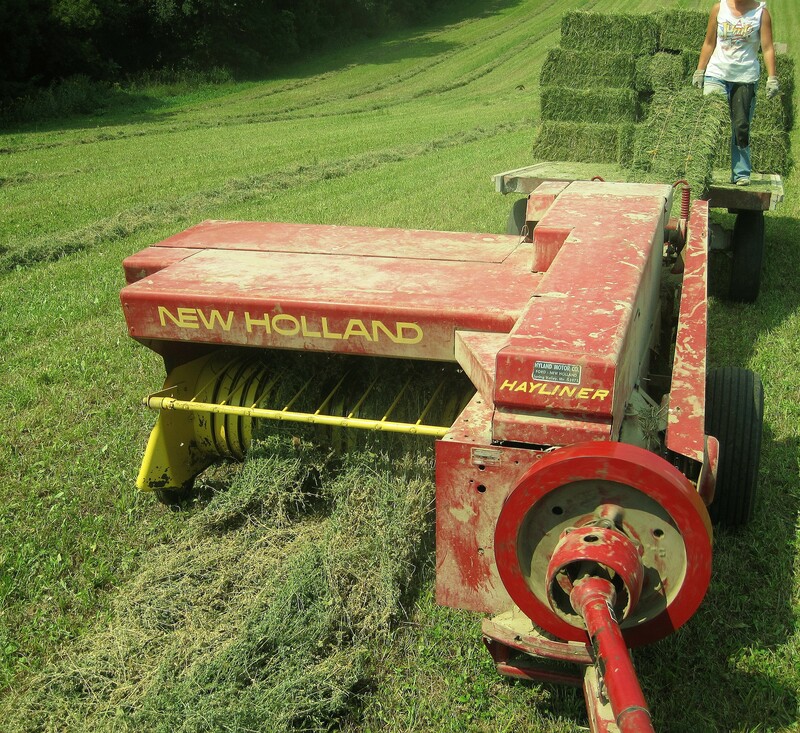 Our hay wagon measures 8 feet wide and 14 feet long. Generally our small bales, made by our New Holland baler, weigh about 50 pounds each. We load the bales in four sections. To get them on the wagon without wasted space, we put the first bale in the center, the short side abutting the backboard. The next 2 bales fit on either side of the center bale lengthwise between the bale and the side brackets or chains supporting the backboard. The next six bales go on top of the first layer in a similar fashion in the second and third layers. 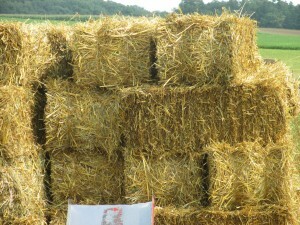 On the fourth layer, two bales straddle the middle and outer bales of the third layer, tying off and stabilizing the stack. Once the fourth layer in the stack is completed, the one who stacks the bales starts again from the bed of the wagon, loading the bales lengthwise to complete the first section of the load. The second section and third stacks of bales are made after the same fashion as the first. The fourth stack is unique. For security’s sake, the lower layer in each front corner of the wagon is laid as the first layer of the stacks in the other sections. The 2nd layer differs. The 2 bales on that layer are criss-crossed over the bottom bales. The third layer is again crossed over the 2nd layer. The center bales are not put in till later. (We must leave space for the person who stacks the bales to stand. It must be left wide enough to hold the depth of the center bale. To do so may require the side stacks to hang a few inches over the edge of the wagon bed.) The center bales are piled up three high like in previous sections. On the top, four bales are stacked lengthwise and overlapping the center bales to ensure more stability to the load. There are times when we need to bale higher, but we feel this is the prudent level. If it is higher, it is more difficult to see behind us as we drive our tractor with the load of hay in local traffic or parking the load if we are unable to unload them at the end of the day. Baling is hard work. But the team enjoys the feeling of accomplishment and comradeship in the process. There is reward in a job well-done.